Staff Sgt. Vernon L. Allison was drafted on Feb. 21, 1941. Following boot camp, he was assigned to Hqs Co., 35th Infantry Division, training at Camp San Luis Obispo, Camp Rucker, and Camp Butner. Assigned to Co F, 137th Infantry, he landed on Omaha Beach, July 6, 1944, and was wounded twice at St. Lo. After recovery in England, he returned to the line and became a Platoon Sergeant in Co F. He received the Distinguished Service Cross for heroic actions at Viviers, France on Nov. 10, 1944. He fought with Co F on to Sarreguemines and Metz, and at war’s end was assigned to Hqs Co, 35th Division. Discharged on June 19, 1945, he died on April 24, 2010. Angelo P. Demos was assigned as a PFC to E Company, 137th Infantry, on Oct. 1, 1944. Within ten weeks, he served as 1st Scout and Squad Leader, and was promoted to Staff Sergeant. As acting Platoon Sergeant, he led the Platoon, without an officer, until the end of the war, often leading special patrols. He served continuously in all the Central Europe, Ardennes, and Rhineland campaigns. Following the war, he served in the U. S. Army Reserve for thirty years, achieving the rank of Colonel and commanding the 466th MI Det. and the 3345th USAR School. Among his awards are the Legion of Merit, Bronze Star Medal, and Combat Infantryman’s Badge. He was president of the 35th Inf Div Assn. in 2005. He resides with his wife, Chrissie, in Pinecrest, FL. T/Sgt Kenneth L. Faulkner joined Company C, 137th Infantry on February 15, 1941, at Camp Robinson, AR. Training with the unit in California, at Camp Rucker, AL, and at Camp Butner, NC, he landed on Omaha Beach, France, on July 7, 1944. Wounded in the eye at St. Lo and evacuated to England, he rejoined his unit a month later, and on Nov. 19, was again wounded, this time in the leg. Following a leave, he again took charge of his platoon and fought with it all the way to the Elbe River. Discharged on Aug. 2, 1945, he spent much of the past 65 years keeping in touch with Company C members. A retired Woolworth manager, he lives in Birmingham, AL. Staff Sergeant Raymond M. Kirkland enlisted in the U. S. Army on March 12, 1943, and entered combat with Company F, 320th Infantry on July 19, 1944. A week later he won the Silver Star for gallantry in action when he advanced alone ahead of his unit to knock out an enemy machine gun position. In April of 1945 he was awarded the Distinguished Service Cross when he and his men crossed the Saar River, knocked out two machine guns, and organized a strong defense which defeated the German counterattack and allowed the 320th Infantry to cross the Saar River. 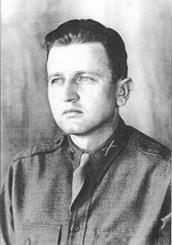 He was discharged in 1945 and died in 2005 in San Antonio, Florida. Technician Fifth Grade Harold J. Lange was a Medic in Co C, 320th Inf, joining the unit at Camp Butner, NC. Assigned to Co B, 320th Inf, he entered Europe in July, 1945, fighting at Normandy and St. Lo, demonstrating heroic and self-sacrificing medical care for his soldiers. On Oct. 2, 1944, he was killed in the Gremecy Forest, when he went forward to care for the unit’s casualties. Despite his medical brassards, Nazi machine gun fire cut him down. The next day he was found among the dead, many of whom wore first aid dressings he had applied. 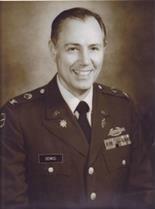 He received the Distinguished Service Cross, Silver Star, and Purple Heart. He is buried in the Lorraine American Cemetery, France. Captain Lawrence Malmed entered military service from Pennsylvania, and became commander of Co L, 137th Infantry. He received the Bronze Star for actions at Orleans, France on Aug. 22, 1944. Crossing into German territory, he demanded the surrender of 3000 Germans on the enemy side of the Loire River. The German commander refused, but 150 Germans voluntarily surrendered. He received the Silver Star on Sept. 29, 1944 in the Gremecy Forest. After setting up his Command Post in a German pillbox, he and his men were captured. When additional American forces arrived, he convinced the Germans to release him and become his prisoners instead. A native of Illinois and a graduate of West Point, Gen. Sebree served as the Asst. Division Commander, Americal Division, in the Pacific Theater, during the Guadalacanal Campaign. In Oct, 1943, he became Asst. Division Commander, 35th Infantry Division, serving in that position until Feb, 1945. Leading Task Force S (Sebree), a combat heavy force, he pushed the Germans back of the Vire River, breaking out of the Cotentin Peninsula beyond St. Lo, and liberated the French cities of Orleans and Nancy. After WW II, he commanded the 7th Armored and 6th Infantry Divisions. He was awarded two Distinguished Service Medals, two Silver Stars, the Bronze Star, and the Purple Heart. Captain Sidney K. Strong of Montana, Co A, 137th Infantry, trained with the 35th Infantry Division in the United States and England. He landed on Omaha Beach on July 7, 1944. As a First Lieutenant, he received the Silver Star a week later, July 13, 1944, for heroic leadership in the hedgerows of Normandy. Fighting from St. 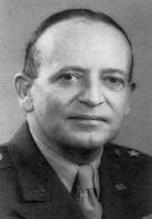 Lo to Hillsprich, he was promoted to Captain and made commander of Company A on Aug. 18, 1944. On Nov. 23, 1944, he was killed by German fire at Hillsprich, France. He received a second Silver Star on that day for “intrepid bravery, outstanding leadership, and coolness under fire.” He is buried in Lorraine American Cemetery, France.